You are here: HomenextTransportnextTransport - shipsnextSPILIADA in Tilbury. The SPILIADA in Tilbury wih a recent name change. More information please RWJ. She has a very British look to her. As you mention, Jack, this vessel had a British look to it. 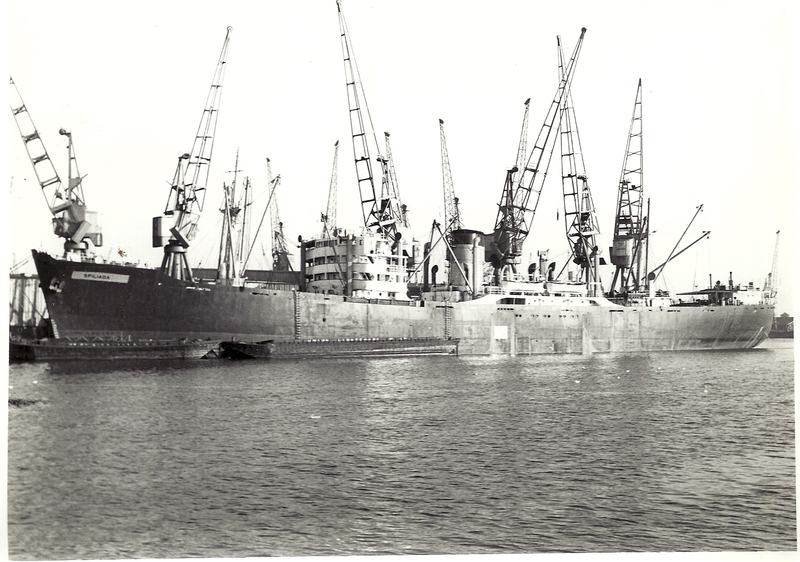 The motor vessel SPILIADA (7049 tons gross, 10,070 deadweight) started life in 1954 when completed in Glasgow as INDUS for London shipowner James Nourse Ltd, a member of the P&O group. Like other Nourse vessels, it was engaged mainly in supporting P&O group company cargo services and was more closely linked with British India. In 1965, Nourse merged with another P&O group company, Hain Steamship Co, to form Hain-Nourse Ltd.
Sold by Hain-Nourse in 1969, this vessel was renamed SPILIADA under the ownership of Sociedad Armadora Insular SA, of Panama, and flew the Liberian flag. It was managed by Embiricos Shipping Agency Ltd, of London. If you were to establish when you took this photo, it will determine if when docked at Tilbury SPILIADA was Liberian or Greek, because in 1971 it was transferred to Naves Transatlantica Naviera, of Panama, and hoisted the Greek flag. Embiricos retained control of the vessel. Sold again in 1974, and twice in 1979, the vessel ended its days as the Panamanian-flagged GULF MOON in a scrapping area on Gadani Beach, Pakistan.